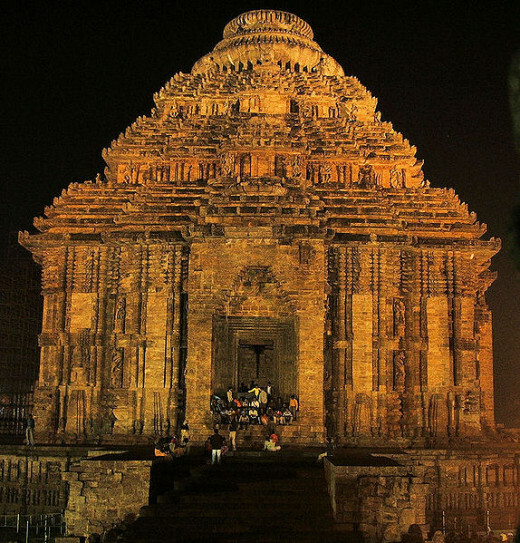 Taking a 35 kms long drive from the temple town of Puri in Odisha (earlier Orissa) state along the coast line of Bay of Bengal in India and culminating this delightful drive along the seashore at a small town called Konark will make you to land at a UNESCO World Heritage Site called Konark Sun Temple. The enchantment of beauty of sunrise and roar of the sea in this area might have prompted its ruler in the 13th century to construct a magnificent temple which can be termed as a display of unparalleled architectural mastery. Today, it is in ruins but the grandeur of this masterpiece can still be experienced and enjoyed. That is why it is an important destination for the tourists who visit this part of the world. 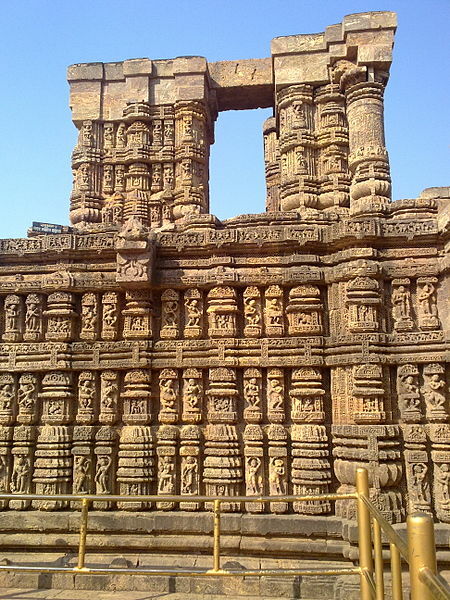 I will take you to Konark to have a glimpse of this architectural grandeur. 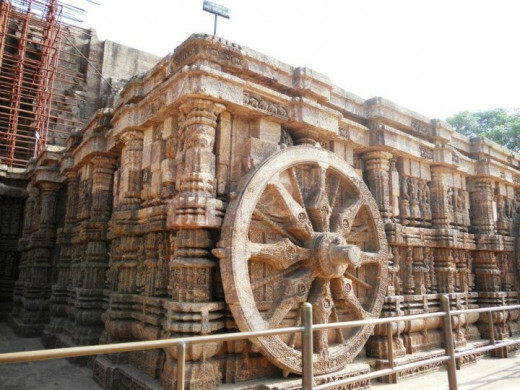 The structure of this historical temple can be appreciated by imagining a chariot of the Sun God which is run on 12 pairs of wheels and pulled by 7 horses. 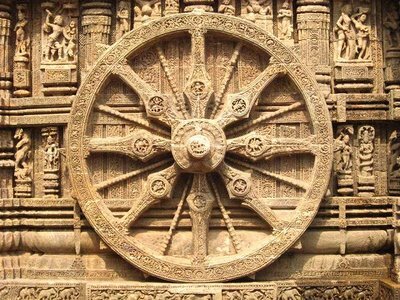 These 12 wheels are superbly carved and each of these wheels is representing a month of the year. The 7 horses represent the days of the week. The gigantic chariot is pulling the Sun God while performing journey across the skies. 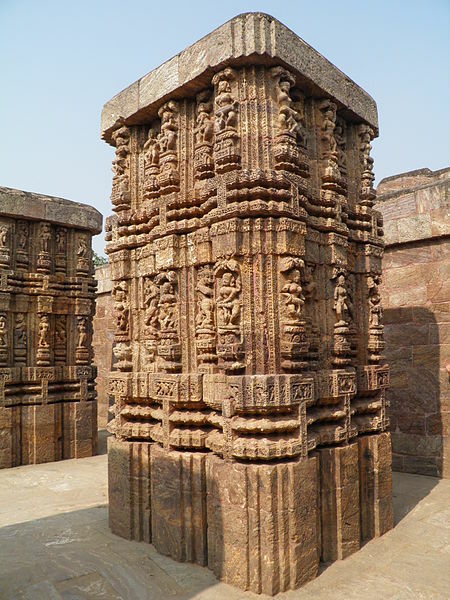 King Narasimhadeva, who ruled the Eastern Ganga Dynasty between 1238-1250 CE got it constructed using oxidised and weathered ferruginous sandstone and this continued to be referred as the Black Pagoda for centuries. The structure remained as a landmark for those having sea voyage in that area. These are different dimension, ranging from miniatures to giants. One has to imagine the richness of these stone carvings by only watching the ruins that are exhibited now and put these heavily decorated stuctures into the historical perspective to appreciate their richness. The natural surroundings of the Temple with a wide variety of trees planted around also is a pleasant experience. The panoramic view of the great structure can also suggest the amount of work and the number of men involved in creating it. It is a matter of satisfaction that the structure is being maintained and the remaining parts of the ruins are preserved for the next generations to have a glimpse of this historic attraction. 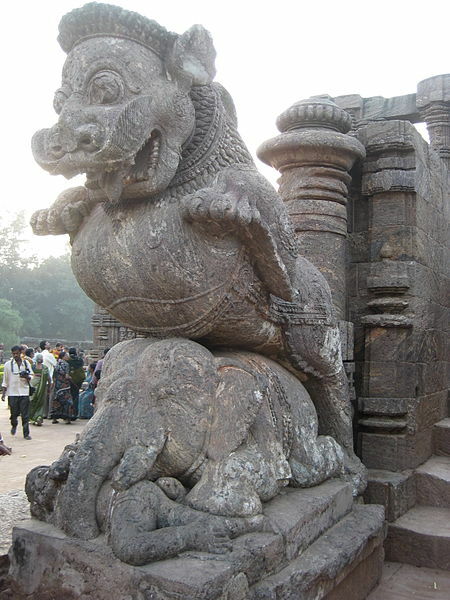 As per old traditions the entrance of Konark Sun Temple is guarded by two giant lions. Each lion is in the act of crushing a war elephant. Elephants lie on top of a human body. These sculptures depict the pride of the Lion and elephant as money. Both money and pride crush man. All the three are shown in the image below in detail. 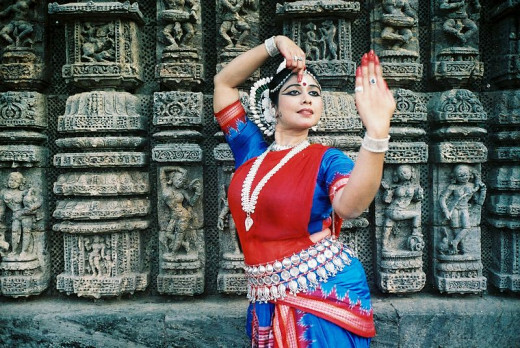 It might be a great privilege of the dancer to perform here and also make an effort to keep the Odissi dance and art alive. Not only out parts of the Temple but even interiors are covered by these stone carvings. There are carvings and carving all around and one wonders about the dedication of the artisans who raised this structure. Stones look elegant during night and this Pagoda like structure looks gorgeous. Even after eight centuries of its existence the stone do not lose their magnificence. Even ruins can give so majestic looking in flashlight, it enhances the looks of this ancient Temple. Your experience about stone carvings? 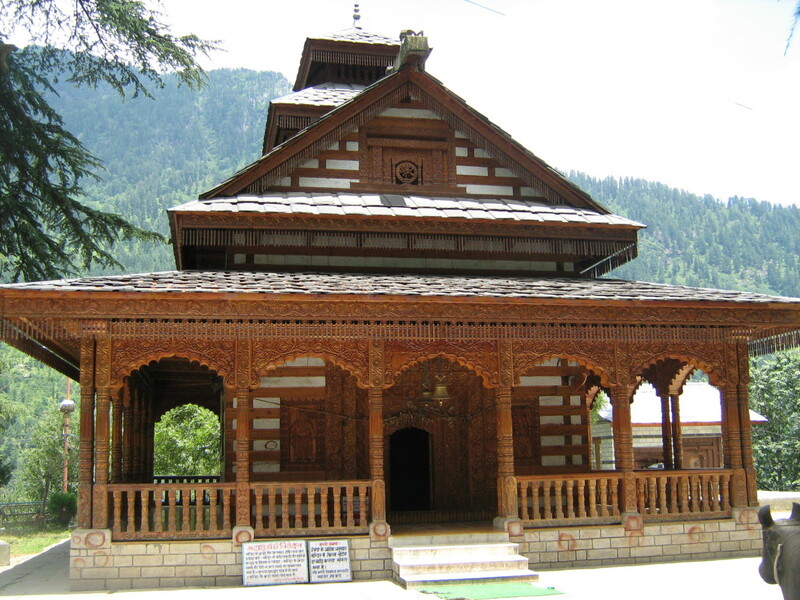 Have you ever visited a Temple with stone carvings all around it? Visits to certain historical places leave everlasting impressions. Recently, a friend of mine visited this place which stimulated me to revive those memories. Thanks for your words, Chitrangada. 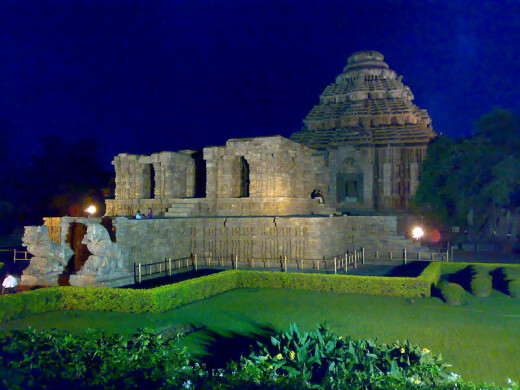 Excellent article about the magnificent Konark temple! I visited this wonderful place, full of architectural beauty last year. Your hub refreshed my sweet memories. As an Indian, I feel proud of such amazing, ancient heritages. Thanks for spreading the information through your well presented article! sunilkunnoth2012, you are welcome. 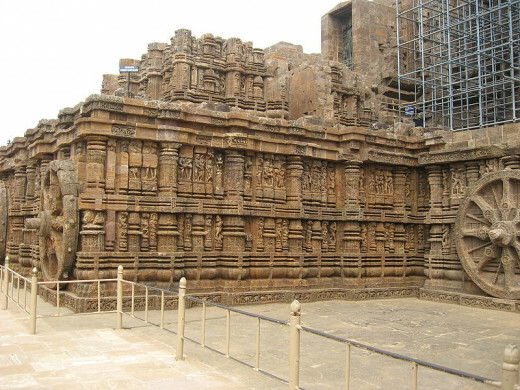 Odisha is a great state and I had the privilege of visiting Sun Temple and Puri more than three decades back. I still carry those memories with me. Thanks for showing your interest. Wonderful. I appreciate the style and presentation. I have added a link to this hub on my latest hub on Odisha. Keep on writing more such stories about other places of interest. Thank you for sharing. Thanks radhikasree. I am glad you could appreciate the grandeur of the art at Kornark. Have a great day. It was an enlightening read, especially to know about the meanings of the sculptures. 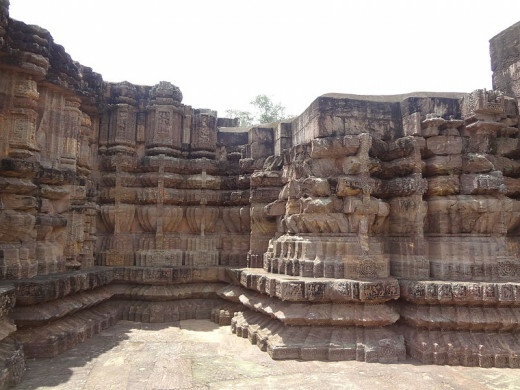 The panoramic view of the temple is magnificent and can be described as a blend of the art of God and man. Great hub! Voted up, useful, beautiful and awesome! Sharing here. bdegiulio, Thanks for visiting. I saw this place when I went to Puri on a pilgrimage. The beach at Puri and this nearby magnificent temple impressed me a lot. But it was long back. Ruchira, One needs to spend quite sometimes to understand it fully. It is much more than what we read and are normally told. Thanks for stopping by. ladydeonne, It needs to be seen to believe. One wonders how could it survived for centuries and how beautiful would it be in 13th century. All we see today are ruins. Thanks for visiting. You have done it again! Your history of India in photos is astounding! 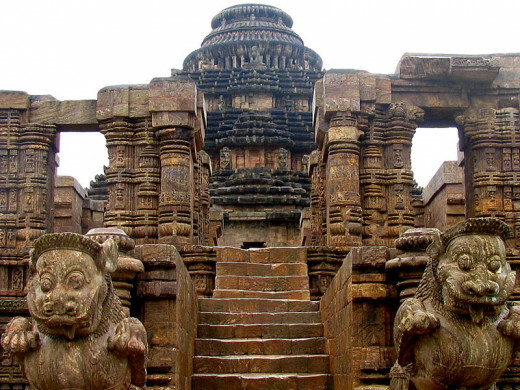 The Konark Sun temple is truly a masterpiece that transcends time and culture. The addition of video was great....it was as though I was truly at and in the temple. I am fascinated with the odissi dance fom. Great clicks...loved how you could capture the true Essence of these stones and their carvings.